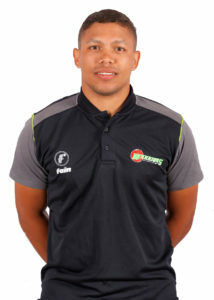 Clyde Fortuin is a young, energetic and talented wicketkeeper who has played for the Western Province, South African Schools, South Africa Under-19s and Warriors teams. In 2015, he was part of the Border Cricket team which played in the Africa T20 Cup. He loves taking road trips to experience new places and eating steak and chops on the braai. Clyde’s most memorable cricket moment is winning the U/19 World Cup in 2014 for South Africa. In his First-Class career Clyde has a high score of 144* with an average of 25.22. The right-handed batsman was born on the 18th August 1995 and hails from Cape Town. He went to St Joseph’s College. If he wasn’t a professional cricketer he would be a football player or race car driver, Clyde fell in love with cricket at a young age and has fashioned himself like his role model, AB De Villiers.